Habitat loss from human encroachment is one of the principal reasons our pollinators are disappearing. We believe there is an opportunity in the unused space in solar fields. Non-native honey bees are important pollinators, but it is our native pollinators- those butterflies, hummingbirds, moths, bees and other insects moving pollen from plant to plant- that provide a vital and sustainable reproductive pathway for many of the fruits, vegetables, nuts, and plants we consume. Most solar fields are covered with stone or planted with turf grass. We feel that this is a missed opportunity. 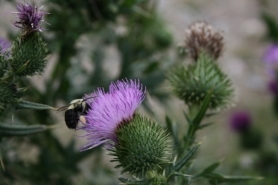 bee the change places a diverse array of plantings in and around the solar field, with the goal of supporting a diverse array of pollinators. The central principle behind everything we do at bee the change is best expressed by the sanskrit term 'ahimsa'. The root 'hims' means to strike, and the core of the philosophy from which non-violence comes is the opposite of striking, 'ahimsa', or non-harm. Our first field, installed in May 2016, and several more fields are under construction at this moment. 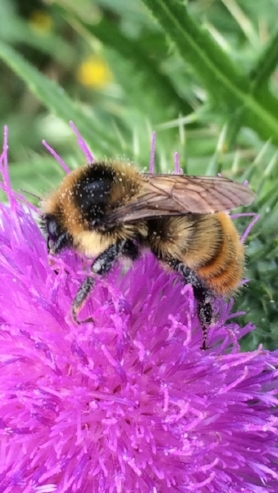 A survey of the pollinator population in our first year at the South Ridge field in Middlebury demonstrated 34 unique pollinator encounters in a 15 minute period. One year later, surveying the same plots, we encountered 174 unique pollinators in 15 minutes . That impact will increase the productivity of plants beyond the boundaries of the solar field and support downstream species who rely on that productivity- birds, fish, other wildlife and, of course, human beings.